To succeed online, grocery brands need to adopt a different strategy from what has worked offline. Product content online must first help consumers easily find a product when they search on a retailer’s site, and also help to close a sale once that consumer actually visits the product detail page. This dual role for your product content is particularly critical on Amazon, where shoppers are used to a broad selection and expect the utmost convenience and relevancy. Our new report, The Winning Elements of an Amazon Grocery Page, analyzed more than 15,000 Grocery and Gourmet Food product pages live on the ecommerce giant. The study includes more than 4,000 brands. We used the Amazon Sales Rank of each product within the Grocery and Gourmet food category to determine top performer and poor performer averages. Use this data to evaluate your product content on Amazon. Successful brands are speaking to their prospective customers with engaging content, in a way that takes into account Amazon’s algorithm, unique user experience, and shopper journey. Meanwhile, across the every price point, the more robust brand pages — those with longer product descriptions, and more images, videos and bullet points — outperformed the competition. 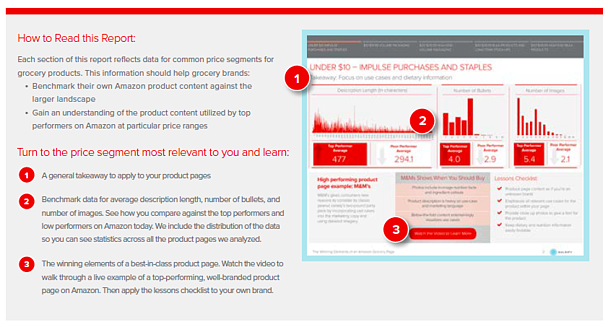 Get the full set of data, including top product page examples, to better prepare your strategy for 2018 and beyond.